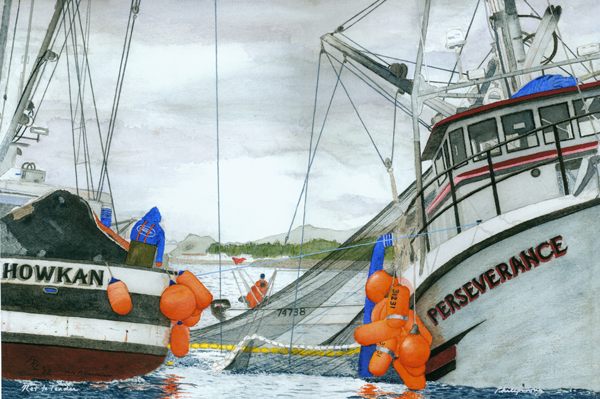 When herring return to Sitka Sound each spring, so does watercolorist Phil Long. This year’s Harbor Guide cover image is from Long’s painting “Net to Tender” that depicts an action scene from the Sac Roe fishery. Long lives in Sitka for four months of the year during the herring and salmon seasons to oversee the movement throughout Southeast of refrigerated shipping containers. The containers are destined to be packed with fish and shipped, mostly to Asia. The rest of the year, he lives in Oakland, California. 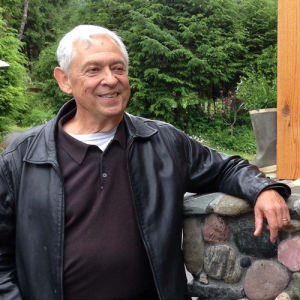 After his 2007 retirement from container company giant American President Lines, Long immediately signed on with them as a contractor, tasked with servicing processing plants from Valdez to Ketchikan, a job which can be stressful. Working in watercolors carries some tension, too, because there’s little room for mistakes. Long goes slowly, taking up to 30 hours on a piece. He says his careful style can make his work resemble watercolors painted in the 1800s. Long’s only instruction in painting came in 2003, when he took a weekend course in Mendocino, California. As a boy, he sketched out scenes on the canvas for his grandmother, also a painter. During corporate meetings, Long would surreptitiously draw cartoons of the people in the room. Long’s paintings have so far been of Alaska or India, where he found the colors especially inspiring. He may start a series on the San Francisco Bay Area. Long’s work can be seen on his Facebook page and also at Fishermen’s Eye Gallery in Sitka.